When entering the Forex market, it is important to follow a strategy that will help you to achieve your goals. Making financial decisions based on a gut feeling is not a reliable way to achieve consistent returns. A sound currency trading strategy built on tried-and-tested methods will help you to keep emotion out of the equation, while maintaining the discipline to ensure that you don’t make impulsive or panic decisions. There is no one right answer when it comes to currency trading strategies. Different traders use different strategies according to their investment goals, trading experience, trading style and appetite for risk. Before we explore the most popular trading styles and strategies, let’s discuss technical analysis and fundamental analysis. All trading strategies rely either on technical or fundamental analysis, or a combination of the two. While the topic of which is better has always been debated amongst Forex traders, it is important to know the difference when choosing your trading style and developing your personal trading strategy. Technical analysis relies on reviewing past currency price trends to determine how they will behave moving forward. The rationale is that market movements are determined by supply, demand, and mass market psychology. Many traders believe that technical analysis gives them an objective, visual and scientific basis for determining when to enter or exit the market. Fundamental analysis involves studying the fundamental indicators of an economy to determine how a currency’s value will move in relation to another currency. Factors that are reviewed include monetary policies, economic growth, unemployment and inflation rates, and interest rates, amongst others. Fundamental analysis is usually implemented in long-term trading strategies and can be very complex. A trader’s personality plays an important role in Forex trading. Some prefer fast-paced trading on short timeframes yielding small returns, whilst other traders opt for long-term trades that are kept open for days or weeks. This will determine the trading style that a trader will use. Day traders aim to profit on the volatility of an asset by making several trades with the expectation of making small gains on each transaction. This is a high-stress, high-intensity trading style wherein traders open and close trades over the course of a day and only hold their trades for a few hours. Day traders typically base their decisions on technical analysis. It is important to keep a keen eye on the market in order to be able to react quickly to any developments. One advantage of day trading is that it is not exposed to the risks encountered when leaving trades open overnight while market conditions may change, unbeknown to the trader. A more extreme form of day trading, scalping is the fastest trading style that often yields more returns than day trading. Traders often hold a position for seconds or minutes and aim to make small, frequent profits. With this trading style, it is crucial to monitor the markets closely in order to benefit from small opportunities. Scalping relies on a short-term technical analysis. Position trading is a long-term trading style, where trades are held for several months in some cases. Traders typically use fundamental analysis for position trading, which may be supplemented with technical analysis to establish ideal entry and exit points. With this trading style, it is important to be resilient during short-term dips in the market. Position trading is well suited to those who do not wish to monitor the market constantly. Market selection: Traders must select the currency pairs they will trade, and become experts at reading those pairs. Position sizing: Traders must decide the size of each position in order to control the amount of risk in each trade. Entry points: Traders must establish rules controlling when to enter a position in a given currency pair. Exit points: Traders must establish rules controlling when to exit a position and when to close a losing position. Trading tactics: Traders should establish rules for how to buy and sell currency pairs, including the selection of the most suitable execution technologies. Trend trading is a popular trading method with a successful track record. Using this strategy, traders identify an upward or a downward trend in a currency price movement using technical analysis and then decide when to enter or exit the market accordingly. A simple and popular Forex trading strategy, range trending is based on the idea that a currency will return to its point of origin regardless of the direction in which it trends. Traders base their trades on the possibility of prices trading at the same levels several times and they may benefit from fluctuations several times. A ‘breakout’ refers to the point when the price breaks out of a consolidation or trading range, or when the market breaks beyond a key support or resistance level. Breakout traders aim to profit by entering the market at the point of breakout. Breakouts produce the best results when traded in the direction of the underlying trend. Momentum trading is based on the assumption that strong price movements in a particular direction likely indicate that the trend will continue in the same direction. Moreover, weak movements may indicate that a price is losing strength and may be heading for a reversal. Countertrend trading, on the other hand, refers to when traders aim to anticipate a reversal in a price trend. Traders seek to enter a trade ahead of the market in order to make a profit from the reversal. Countertrend trading is considered more complex and high-risk as reversals can be difficult to identify. In pivot point trading, traders aim to determine resistance and support levels based on an average of the previous trading session high, low and closing prices. The theory is that the average can help to predict the next session’s likely highs and lows, and intraday market reversals. These averages are widely used in the market and are therefore considered a healthy gauge of how long a short-term trend may continue. Additionally, the averages may predict whether a particular range has been surpassed and a new breakout will occur. When trying to determine which Forex strategy is the best or potentially the most profitable, there really is no one single answer. Every strategy will be suited to the individual trader according to their own preferences and trading style, the time they have available, and their profit goals. The vast number of strategies available also makes choosing one particular method difficult. You may decide to use one strategy exclusively, or perhaps you’ll opt for a combination of a number of different strategies to create your own customised approach. Whatever you decide, remember that there is not a magic formula and none of the currency trading strategies available are guaranteed to work all of the time. Trading has its ups and downs, and a sound trading plan should always include strict risk-management rules. It’s important to back-test your strategy by using historical price data to make sure it performs well before committing any capital. Furthermore, familiarising yourself with a range of different strategies is a good idea. Many successful traders experiment with different styles and strategies to help interpret price movements and take advantageous trading positions. Forex trading offers the clever trader many lucrative and exciting opportunities if the most suitable strategy is employed and risk is managed effectively. 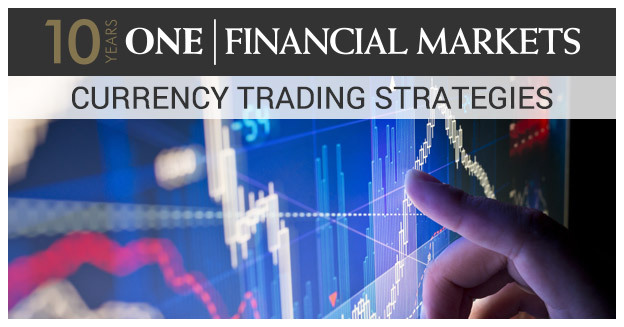 Contact the experts at One Financial Markets today to take your first guided steps in learning the marketplace.